You Have Never Had Beef Jerky Like This! A few weeks ago, Snack Girl featured an alarming photograph of mechanically separated chicken. Is this what goes into our food? Well, most jerky that you find at the convenience store is made of pork and mechanically separated chicken. And, it doesn't taste very good. But, there is an alternative! I recently made a new pal, Rod, a rancher from Wyoming. He runs Rocky Mountain Organic Meats and he can be found fixing fences and making organic beef jerky. The way he makes it is exactly the opposite of the way commercial jerky is made. First of all, the beef is organic - which means NO feedlots, NO antibiotics or hormones, NO animal by products in the feed. And it means plenty of grass, roaming, clean water (snow melt) and freedom (which cattle really like). He takes muscle from one of the cows, mixes organic spices, coats the meat with them, and then hangs them in a smoker. The smoke is produced by hickory and apple wood. Then, he hand cuts it and puts in plastic bags for our consumption. It is an INCREDIBLY inefficient way to prepare beef and that is the way Rod likes it. He believes food needs to be sustainable like water and air - and he just needs a few thousand customers to support his small business. It isn't easy for cattle ranchers to get a USDA certified organic rating. So, when you see it, you know it is something special. But, ORGANIC, isn't the reason why I love this beef jerky. This stuff tastes great! It is low in calories and a great source of protein. You can shove it in your backpack or purse and it will keep forever. For one ounce of beef jerky, there are 90 calories, 1 gram of fat, and 11 grams of protein. Also, you have to really chew it. This jerky can't just be shoved in your mouth. It will take you a while to eat it and it will keep you satisfied until your next meal. Just to let you know, Rocky Mountain Organic Meats also features "beef sticks" which remind me of cheese sticks (see beef sticks). They are great to shove into a lunch box. My kids couldn't chew the jerky, but they loved these. My favorite would be the organic honey pepper beef jerky. tweeted this on twitter using the tweet button in the share box. I love love love jerky. My dad makes his own venison jerky which is great. Can't wait to try the Rocky Mountain varieties, and I see they make organic hot dogs, too! The beef pepper jerky sounds great! the honey pepper beef jerky sounds good. Maybe I'll treat my dogs with an organic treat too! The honey jerky sounds fun. This looks like a great snack even though I am not normally a jerky person. Their sausages also look really great. mmm! I keep jerky on hand and would love to try "real" jerky. The organic beef honey jerky looks amazing! It all looks good but I'd like to try the beef sticks or the breakfast sausage. I just LOVE summer sausage! But everything looks sooo good! Thanks for spreading the word! The honey beef jerky or the summer sausage would be my favorite. It all looks really delicious, but as a lifelong New Yorker the one I'd be most interested to try is the pastrami. YUM. I'm a summer sausage junkie. That'd be my choice. Any beef, any time, any way! It's what's for snack time! 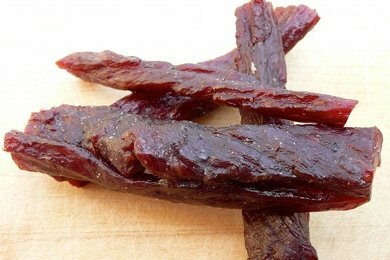 I'm a big fan of jerky and usually make my own, but I would love to try the Rocky Mountain Organic Meat Snacks jerky! The spicier the better for me! Honey beef jerky looks so good!! Great products! Mmmmm.......beef pepper jerky! Sounds so good!! The beef sticks look good. I also follow you on Twitter and will re-tweet this post.